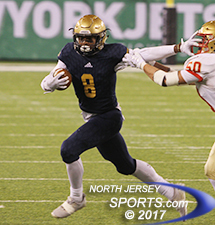 Marquez Antinori scored both first half touchdowns for NV/Old Tappan, which sweated out a 31-28 win over Mount Olive in the North 1, Group 4 final on Saturday night at MetLife Stadium. EAST RUTHERFORD – For a team that has been the best among North Jersey’s public schools since Day 1 of the season, one that has excelled in everything from it preparation to its play on the field that included 10 blowouts among its 11 wins, it had to be a little unnerving then that Northern Valley/Old Tappan really had no idea what it was in for when it took the field for North 1, Group 4 state sectional final on Friday night. The Golden Knights’ opponent was Mount Olive, a team that went 1-9 last year and left little in the way of a paper trail on its way to the last game of the season at MetLife Stadium, the biggest of all stages. There was some guesswork involved for Old Tappan as it tried to get ready to win its second championship in the last three years while also finishing off what would be the school’s best ever football season. The mystery was solved rather early as Mount Olive showed itself to be more than just a worthy opponent, but rather a real threat to leave the Meadowlands with state championship trophy. 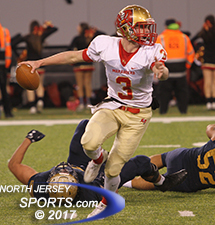 The Marauders held Old Tappan to a three-and-out on the game’s first offensive possession and then put together a 63-yard drive the first time it had the ball. Liam Anderson’s one-yard quarterback sneak for a touchdown with 6:55 left in the first quarter put Old Tappan behind on the scoreboard for the first time all season. Mount Olive quarterback Liam Anderson completed his first 11 passes and was outstanding all game long. Mount Olive never gave an inch, but OId Tappan never did either and, locked in their first nailbiter of the season, the Golden Knights did just enough, including Jack Dippolito’s recovery of a fumble in the final 30 seconds, to finish what they started. Old Tappan capped its perfect 12-0 season with a 31-28 win and then proceeded to be welcomed back to the Northern Valley by a cavalcade of fire trucks and other supporters from the four towns that make up the school’s sending district. It was a battle for sure as Anderson scored twice in the first half for Mount Olive and Marquez Antinori, the senior running back, did the same for Old Tappan, which managed to get into halftime tied at 14 after Anderson was brought down just three yards shy of the goal line on the final play of the second quarter. Quarterback Nick McNerney after taking the final snap of Old Tappan's perfect season in which he threw 23 TD passes without and interception. Old Tappan got the advantage that it gave away in the first half by stopping Mount Olive on its first drive of the second half. The Knights turned that into their first lead of the night, 17-14, when Eric Rodriguez connected on a 25-yard field goal with 3:20 left in the third quarter, but the Marauders answered right back when Anderson turned a fourth-and-3 from the 7 yard line into a touchdown strike to Evan Kelson, who beat his man to the inside on a slant and rolled into the endzone to put Mount Olive back in front, 20-17, after the extra point was missed. “The quarterback on that team was phenomenal, the kid was unreal,” said Dunn, speaking of Anderson, who completed his first 11 passing attempts. “We couldn’t get a hand on him, he was phenomenal. The Marauders were in pretty good shape at that point as they forced Old Tappan to punt on the ensuing possession that spanned the third and fourth quarters, but could not maintain a drive and the Golden Knights took the opportunity to hit their first big play of the game. With just less than nine minutes to play in the game, Nick McNerney hit Bryan Baker over the top for a 64-yard catch and run that put the Knights up 24-20. The next time OT had the ball McNerney, who finishes his senior season, his only one as a starter, with 23 touchdown passes against zero interceptions, hit Johnny Lohrer for an 8-yard score that made it 31-20 with 4:24 to go. Evan Kelson caught three TD passes for Mount Olive, which was 1-9 last year before giving Old Tappan all it could handle on Saturday night. It took Mount Olive just two minutes to go right back down the field and stick the ball in the endzone twice. Anderson hit Kelson for a three-yard score and the same duo connected on the two-point conversion to pull the Marauders within 31-28 with 2:21 to play. 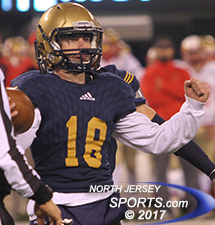 Old Tappan’s Nicholas Orecchio recovered the onside kick, but the Knights could not run out the clock, in fact they could only force Mount Olive to use only one of its two remaining timeouts. A 57-yard touchdown by Lohrer was called back by a chop block, McNerney ran out of bounds on a scramble and a 13-yard catch by Sal DeBenedetto on third down still left Knights 11 yards short of the first down that would have iced the game. Instead, a bobbled snap and a hurried punt set Mount Olive up at its own 34 with 58 seconds to play and it got as far as the Old Tappan 30 on an Anderson to Kelson hook-up. 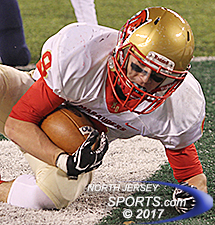 The Marauders hurried to the line to spike the ball, but the snap was mishandled, Dippolito fell on the fumble and Old Tappan could finally breathe a sigh of relief. As for those kids that Dunn is proud of, maybe senior center Scott Essman, whose father Billy played on a state championship team at Old Tappan in the mid-1980s, summed it up best.